Women continue to lag behind their male counterparts in partnership appointments and management positions as certain gender-based stereotypes persist. And even though three women now sit on the U.S. Supreme Court, a woman is chief justice of the California Supreme Court and two of San Diego’s top prosecutors are female, a glass ceiling still exists, the panel agreed. While the area’s legal profession consists of approximately 50 percent women, the Lawyers Club of San Diego’s most recent gender bias survey indicates a gap exists between the number of male and female partners. Part of it is a reflection of society, according to Lisa Martens, a principal in the San Diego office of Fish & Richardson. “I feel our country, as far as we’ve come, we still have a long way to go in a lot of areas far beyond the legal field,” she said. One of the reasons why there aren’t as many female partners is by choice. Some women decide they don’t want to put in the hours required of a partner, choosing instead to spend more time with family. Others get creative and start their own firm, where they can practice on their own schedule. “But women who elect to stay in the legal profession today face challenges with perception as they try to rise the ladder in the event they do have children,” said Rosing, herself eight months pregnant at the time of the discussion. She noted, however, that the members of her firm, Klinedinst, have been very supportive. 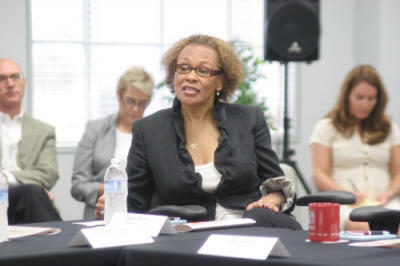 Janice Brown, who founded and runs her own law firm, Brown Law Group, said women not only have to change other people’s perspectives, but they also have to change their own. Progress has been made, however. It is not uncommon for women with children to become partner. Law firms tend to be more accommodating now, according to Julie Mebane, a real estate partner with Duane Morris. Smaller firms can be even more flexible, according to Anne Rudolph, an associate at Hughes & Pizzuto. In her previous firm in Eureka, Calif., Rudolph became a partner within three years. Kristan Shepard, an associate with the boutique trusts and estates law firm Goodwin Brown Gross & Lovelace, has had a positive experience with her male counterparts. All four of the partners in the seven-person firm are men. Fish & Richardson’s Martens said she doesn’t see there being a real pay disparity between men and women these days. Law firms usually have a compensation formula that involves the number of years out of law school, how much business you bring in and the amount of billable hours, regardless of gender. But some subjective criteria can be used in determining who gets elected partner, according to Brown, and those factors can work against women. Patrick, the deputy district attorney, agreed that certain traits are popular in the legal field. Klinedinst’s Rosing said that because of these perceptions, women litigators have to be careful with how they present themselves to a client or the court, making sure not to be too aggressive but not too soft-spoken either. They have to think how to modulate their voice. “Little things that men don’t have to think about,” she said. Brown said women can overcome some of the barriers they face by being confident and telling the truth when it comes to the contributions they make to the job.